More than 100 people attended a community forum in Baraboo on Thursday night to discuss a photograph of local high school boys giving what appears to be a Nazi salute just before prom last year. The meeting, held at the Baraboo Civic Center, was organized by concerned citizens after the photo surfaced on social media. 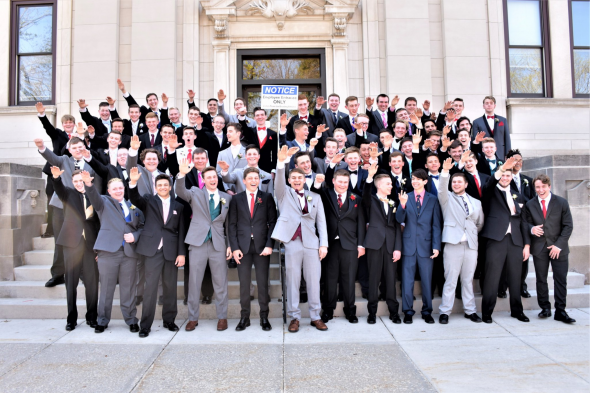 The photograph shows a group of boys dressed for their high school prom last spring with many of them stretching their right arms in what critics say is a Sieg Heil salute. The picture has drawn international attention to the small city in south-central Wisconsin, and community residents and officials with the city and school district are scheduling a series of meetings to discuss the gesture and how it has impacted others. City officials said the meetings are an effort to "collectively acknowledge the deep significance" of the issue. Most of Thursday's meeting was spent in discussion among smaller groups of attendees, brainstorming how the community should respond to the photo and move forward from the incident. The meeting ended with plans to form a more permanent community organization, with the next meeting date set for Monday, Nov. 26. Baraboo resident Chris Ingles said he felt the meeting was productive and provided a place for residents to feel heard. He said he came to the meeting to add his perspective on how the community can move forward. "I'm a minority in this community. There's not a lot of African-Americans," Ingles said. "And I think it's just important for the community to hear from someone who actually went through the school system here to offer advice on how to raise other people in this community to be more inclusive, to be more tolerant." Ingles said he felt the students in the photo needed to take responsibility for their actions. "They really need to realize that this is a decision that they made that not only affected themselves, it affected their community, it affected their futures, it affected people from other races, other religions and made them feel a certain way about themselves," Ingles said. "It's important for them now to look at this as a learning experience and to see that what they did really did hurt other people and it painted their community in a bad way." But Jim Bolitho, a resident of Middleton who drove up for the event, said he felt the community and the media were jumping to conclusions too quickly. "I understand an investigation is still ongoing and until the investigation is completed, I have a question whether it's premature to even be holding a meeting like this," Bolitho said. He said calls to suspend the students in the photo or withdraw college admissions were "premature" and "judgmental." Meghan Zakaouanou said she though the school district's response has been appropriate so far. "I think it took them a little bit of time to figure out how they wanted to handle it, which was good in the sense that they weren't reactionary," Zakaouanou said. "They took time to really think about the situation and to think about coming from a place of humility and saying, 'Yes, there is a problem and we need to recognize that, we need to grow through that and we need to improve upon that.'" Zakaouanou, a Muslim, said she has lived in Baraboo almost her entire life and felt the community is accepting for the most part. She said she has experienced some discrimination because of her faith, but she felt the majority of the community is "loving and kind." "They want to do the right thing. And I think that if more people are empowered to do the right thing and share their desire to be an inclusive environment, then I think that will spread out to the people that aren't feeling that way. Kind of a reversal of peer pressure, but in a positive light," Zakaouanou said. Baraboo Mayor Mike Palm was one of several city officials who attended the community meeting to observe. He said the turnout was encouraging. "To have people come out on their own time because they love our community and to sit here and tackle some really, really difficult problems, I couldn't be more proud of them," Palm said. "Monday was my worst day as mayor, tonight was my best." The Baraboo School District has set their own public meetings for next Monday and Thursday, Nov. 29. Kelly Dwyer, a Jewish resident of Baraboo, posted on Facebook this week about being contacted by one of the boys in the picture. "I explained that my great-grandfather emigrated from a country in which 97 percent of Jews were killed in the Holocaust, so for our family, that symbol can never be funny. And of course that only 70 years ago, Americans killed Nazis during World War II to save our country and the world, and he took my 'lecture' with grace, not averting his eyes from mine. I told him he was very brave and we all hugged him," Dwyer wrote. In an interview, Dwyer told WPR the boy gave her a heartfelt and sincere apology. "He understands that the gesture was offensive and hurtful and that’s why he apologized, and it was definitely very brave and very courageous, and I think why everyone was so moved (was) because he took responsibility and didn't shy away from how difficult it was," Dwyer said. She said she was pleased that another local Jewish family and city and school district officials were using what she described as a shocking photo as an opportunity to learn from past mistakes. "The school district and the mayor and other city leaders are working on ways to educate people that this isn't funny and I think that will help heal the community too as we move forward," she said. Gov. Scott Walker addressed the photo Thursday afternoon at the Capitol building in Madison. It was his first public appearance since losing the election to now Gov.-elect Tony Evers. "I think it’s just stupid," Walker said. "They’re just a bunch of idiots. Some are trying to brush it off as youthful indiscretion, but still, they're idiots." Correction: An earlier version of this story incorrectly identified Jim Bolitho's city of residence. The story was updated at 11 a.m., Monday, November 19, 2018.